AQUACEL® Ag Advantage enhanced Hydrofiber® dressings with silver and strengthening fiber are soft, sterile dressings made from two layers of 1.2% ionic silver impregnated sodium carboxymethylcellulose fiber with added ethylenediaminetetraacetic acid disodium salt (EDTA) and benzethonium chloride and stitched together with strengthening fibers. Under the supervision of a health care professional, AQUACEL® Ag Advantage enhanced Hydrofiber® dressing with silver and strengthening fiber may be used as stated in the Instructions for Use for the management of: wounds as an effective barrier to bacterial penetration of the dressing as this may help reduce the risk of infection; partial-thickness (second-degree) burns; diabetic foot ulcers, leg ulcers, (venous stasis ulcers, arterial ulcers and leg ulcers of mixed etiology) and pressure ulcers/injuries(partial- and full-thickness); surgical wounds left to heal by secondary intention such as dehisced surgical incisions; surgical wounds that heal by primary intent such as dermatological and surgical incisions (e.g., orthopedic and vascular); traumatic wounds; wounds that are prone to bleeding, such as wounds that have been mechanically or surgically debrided and donor sites; oncology wounds with exudate, such as fungoides, cutaneous tumors, fungating carcinoma, cutaneous metastasis, Kaposi's sarcoma, and angiosarcoma; painful wounds; infected wounds. AQUACEL® Ag Advantage enhanced Hydrofiber® dressing with silver and strengthening fiber should not be used on individuals who are sensitive to or who have had an allergic reaction to the dressing or its components (ionic silver, ethylenediaminetetraacetic acid disodium salt (EDTA) and benzethonium chloride). • Caution: Sterility is guaranteed unless pouch is damaged or opened prior to use. • This device is for single-use only and should not be reused. Re-use may lead to increased risk of infection or cross contamination. Physical properties of the device may no longer be optimal for intended use. • When dressing sinus, tracking/tunneling or undermining wounds use AQUACEL® Ag Advantage Ribbon with strengthening fiber. • During the body's normal healing process, nonviable tissue is removed from the wound (autolytic debridement), which could initially make the wound appear larger. If the wound continues to grow larger after the first few dressing changes, consult a health care professional. The wound should be inspected during dressing changes. Consult a health care professional if you see a) signs of infection (increased pain, increased redness, wound drainage), b) bleeding, c) a change in wound color and/or odor, d) irritation (increased redness and/or inflammation), e) maceration (skin whitening), f) hypergranulation (excessive tissue formation), g) sensitivity (allergic reaction), h) no signs of healing. • If you have difficulty removing the dressing, it should be soaked with water or sterile saline until it removes easily. For partial thickness burns, please refer to the FOR PARTIAL THICKNESS BURNS (SECOND DEGREE BURNS) section of this package insert. • Because AQUACEL® Ag Advantage enhanced Hydrofiber® dressing with silver and strengthening fiber provides a moist environment that supports the growth of new blood vessels, the delicate, newly formed blood vessels may occasionally produce blood stained wound fluid. • AQUACEL® Ag Advantage enhanced Hydrofiber® dressing with silver and strengthening fiber is not compatible with oil-based products, such as petrolatum. • Secondary dressings should be used as stated in the DIRECTIONS FOR USE Section. • Treatment of wounds listed above should be under the supervision of a health care professional. • Appropriate supportive measures should be taken where indicated (e.g. use of graduated compression bandaging in the management of venous leg ulcers or pressure relief measures in the management of pressure ulcers, systemic antibiotics and frequent monitoring in the treatment of wound infection, control of blood glucose for diabetic ulcers, etc.). • For oncology wounds, a secondary dressing of high absorbency may be required. • AQUACEL® Ag Advantage enhanced Hydrofiber® dressing with silver and strengthening fiber is not intended for use as a surgical sponge. • The use of AQUACEL® Ag Advantage enhanced Hydrofiber® dressing with silver and strengthening fiber has not been studied in wounds due to herpes simplex or impetigo. • Clinicians/health care professionals should be aware that there are very limited data on prolonged and repeated use of silver containing products, particularly in children and neonates. • MR-Safe. AQUACEL® Ag Advantage enhanced Hydrofiber® dressing with silver and strengthening fiber is determined to be MR-Safe according to the terminology specified in the American Society for Testing and Materials (ASTM) International, Designation: F2503-13 - Standard Practice for Marking Medical Devices and Other Items for Safety in the Magnetic Resonance Environment. • Blue skin discoloration (i.e., Argyria) may occur after prolonged contact with a silver-containing material. Frequent or prolonged use of this preparation may result in permanent discoloration of skin and mucous membranes. This product is for single use only and is supplied sterile. Discard any unused portion of the product after dressing the wound. Because these reactions are reported voluntarily from a population of uncertain size, it is not possible to reliably estimate their frequency or establish a causal relationship to AQUACEL® Ag Advantage enhanced Hydrofiber® dressing with silver and strengthening fiber dressing exposure. The absolute number of adverse events is unknown, but believed to be very low. Such events are generally transitory in nature and should resolve shortly after discontinuing treatment with the dressing. Should symptoms persist or worsen please seek medical advice. Store at room temperature (10⁰C-25⁰C, 50⁰F-77⁰F). Keep dry. 2"x2", 4"x5", 10 per box. 6"x6", 8"x12", 5 per box. Ribbon: 0.39"x18", 0.75"x18", 5 per box. • Before applying the dressing, cleanse the wound area with an appropriate wound cleanser. • AQUACEL® Ag Advantage enhanced Hydrofiber® dressing with silver and strengthening fiber should overlap at least 1cm (1/2") onto the skin surrounding the wound. • When using AQUACEL® Ag Advantage enhanced Hydrofiber® dressing with silver and strengthening fiber in deep wounds, only fill the wound up to 80%, as the dressing will expand to fill the wound space on contact with wound fluid. • This primary dressing should be used with a secondary cover dressing. Apply the dressing to the wound and cover with a moisture retentive dressing, gauze, or other appropriate dressing. See individual cover dressing package inserts for complete instructions for use. • All wounds should be inspected frequently. 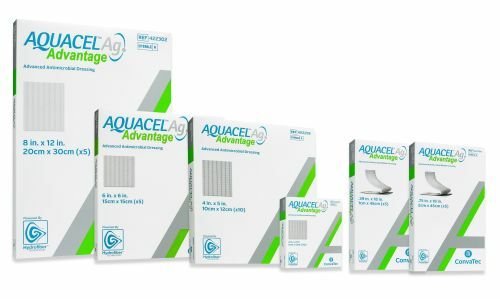 Remove the AQUACEL® Ag Advantage enhanced Hydrofiber® dressing with silver and strengthening fiber when clinically indicated (i.e., leakage, excessive bleeding, increased pain) or after a maximum of seven days. • AQUACEL® Ag Advantage enhanced Hydrofiber® dressing with silver and strengthening fiber should overlap 5cm (2") onto the skin surrounding the burn or other adjacent AQUACEL®Ag Advantage enhanced Hydrofiber® dressing with silver and strengthening fiber. • The AQUACEL® Ag Advantage enhanced Hydrofiber® dressing with silver and strengthening fiber may be covered with a suitable absorbent dressing pad and secured appropriately. • Remove the cover dressing periodically and inspect the AQUACEL® Ag Advantage enhanced Hydrofiber®™ dressing with silver and strengthening fiber while leaving it in place on the burn. • In this indication, adherence to the wound bed of the AQUACEL® Ag Advantage enhanced Hydrofiber® dressing with silver and strengthening fiber is a desired characteristic. • Adhered dressing can be left in place; any areas that have not adhered should be left intact unless clinically indicated or the dressing is saturated or leaking. Where a part of the dressing has been removed, a new dressing may be applied over the top of the existing adhered dressing. • Adherence of the dressing over joints could interfere with movement. • As the burn wound reepithelializes, the AQUACEL® Ag Advantage enhanced Hydrofiber® dressing with silver and strengthening fiber will detach or be easily removed. • Remove the AQUACEL® Ag Advantage enhanced Hydrofiber® dressing with silver and strengthening fiber when clinically indicated (e.g, excessive bleeding, clinical signs of infection). • If adhered dressing needs to be removed before the wound has healed, it should be thoroughly saturated with sterile saline or sterile water until fully softened to ease removal and prevent damage to delicate tissues. • If the wound has not reepithelialized 14 days after the initial partial-thickness (second-degree) burn injury, consider seeking further advice as surgical intervention may be required. • Place the AQUACEL® Ag Advantage enhanced Hydrofiber® dressing with silver and strengthening fiber in the wound and then wet with sterile saline over the wound area only. The vertical absorption properties of AQUACEL® Ag Advantage enhanced Hydrofiber® dressing with silver and strengthening fiber will help to maintain the moist area over the wound only and reduce the risk of maceration. • Cover the dressing with a moisture retentive dressing to avoid drying out of the dressing and subsequent dressing adherence to the wound.